In this research guide you will learn how to get a COMPLETE, non-commercial, Statewide list of Assisted Living & Senior Living Facilities Provided by the State of Washington. 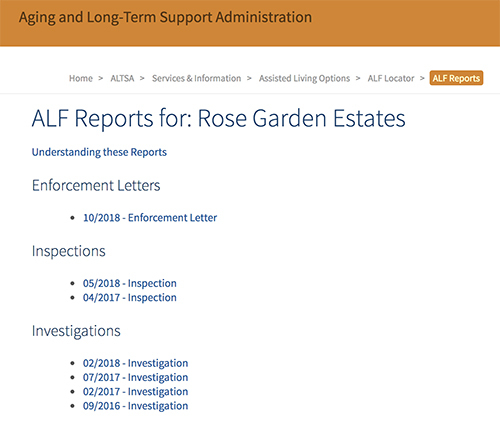 To begin, one of the very best ways you can research Assisted Living Facilities in Washington State is by reading each facility’s inspections & complaints reports. Researching assisted living facilities in Washington State could not be easier, or safer – if you know where to look. As we all know, researching Senior Care online can be a hit-or-miss activity, and often times, sites we land on offer questionable content, sourced from questionable places. The intent of most commercial sites is to make money – not to steer you to the best information. Here, you will discover access to ALL assisted Living and adult family homes Statewide in Washington, provided through trustworthy State sources. Search for facilities specializing in Specific Criteria and Conditions such as Dementia, Mental Health Developmental Disabilities, and more. Additionally, you will be able to SAVE FACILITY DATA in printer-friendly format, or save them in a spreadsheet (Excel) or CSV file. The State of Washington provides a very useful document available for download that provides a great, factual overview of Assisted Living Facilities, Programs and Initiatives in Washington. The document offers the following definition for Assisted Living Facilities, Adult Residential Care (ARC) Facilities, and Enhanced Adult Residential Care (EARC) Facilities in Washington. 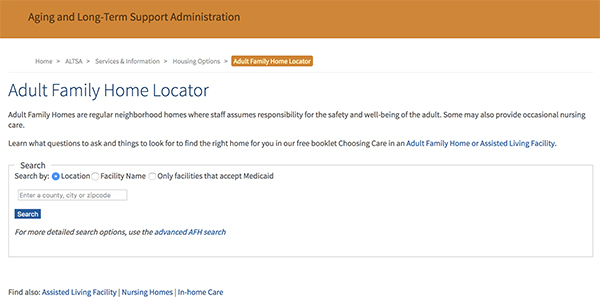 The State of Washington’s Department of Social and Health Services, and their Aging and Long-Term Support Administration offers an OUTSTANDING Adult Family Home and Assisted Locator tool that is free and available to the public. You’ll be able to bypass the typical commercial senior care site, and get ad-free information immediately. Visit the Adult Family Home Locator or the Assisted Living Facility Locator on the Aging and Long Term Support Administration Site. 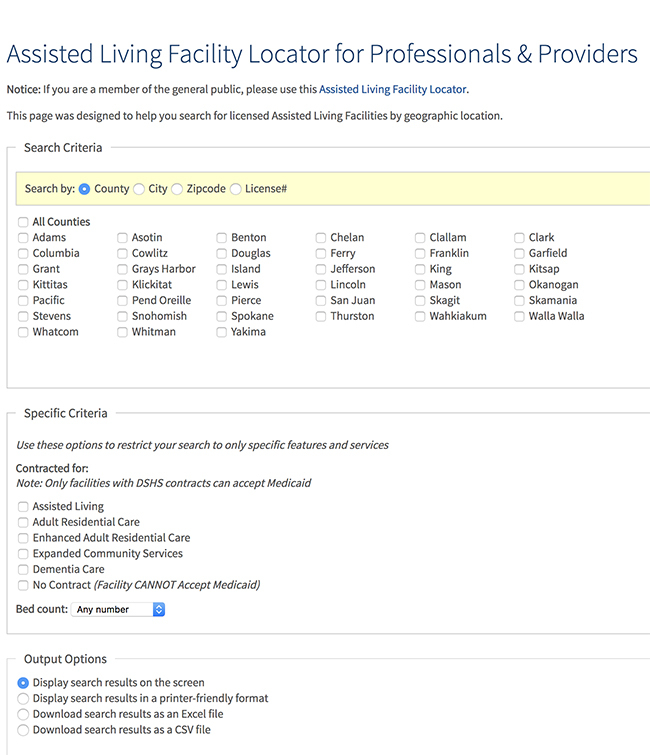 Select “Search By” and then the Location, or Facility Name, and the Only Facilities that accept Medicaid box, if you want. A Directions link that provides a map to the facility. This is such an incredibly useful feature to the Assisted Living Facility Locator tool. 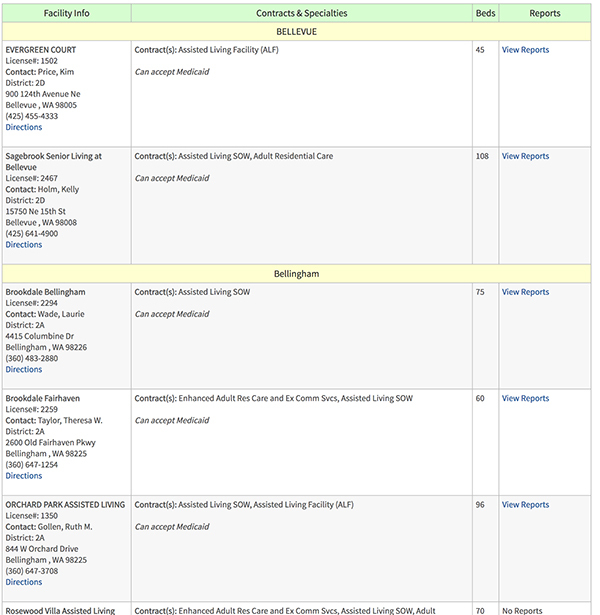 You have direct access to any complaints, inspections and investigations reports filed for each facility. For example, in the list of facilities above, Rose Garden Estates has a number of reports – enforcement letters and inspections and investigations. Selecting any the reports will bring you to a detailed (usually .pdf) document detailing the inspection or investigation. 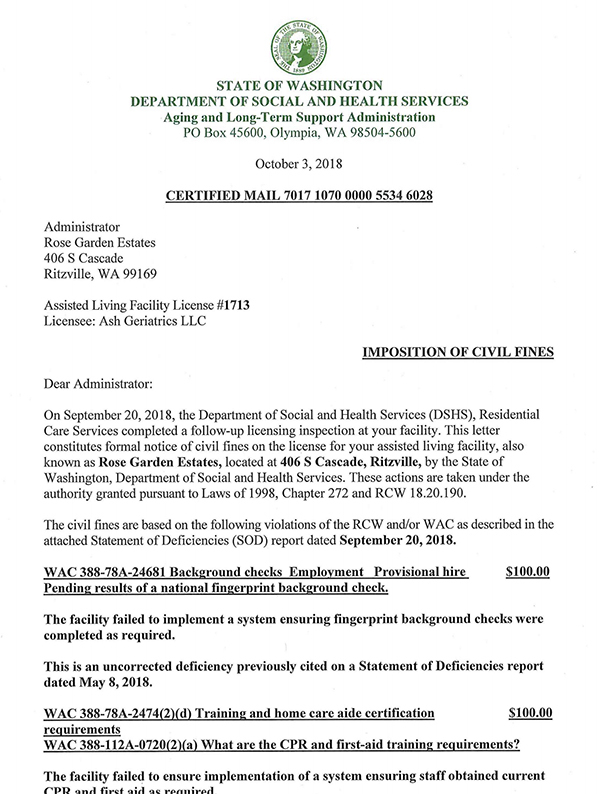 For this example, we chose the ‘Enforcement Letter’ which included an Imposition of Civil Fines to the facility based on a number of Violations. See Definition of Terms used in these reports. The great thing about the advanced search is that it lists all of the counties in Washington State that can be checked for your search. 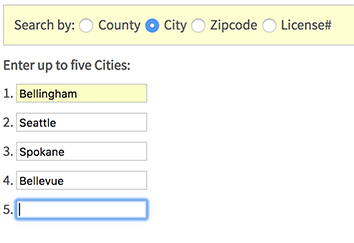 You can also select the “City” field and enter up to 5 cities for your search. The same goes for Zip Codes, and Facility License Numbers. Lastly, with the advanced search function, you can filter your results by Specific Criteria. I find that this is an especially useful feature, as you can filter your results based on facility size. In my time filming facility video tours, and interviewing facility owners and residents, facility size is a major consideration. Some people prefer the more intimate, Bed and Breakfast feel for a facility – usually under 6 residents. Others like the larger, more hotel-like feel for a facility, often times housing more than 100 residents. There are some facilities that number over 1000 residents. These facilities often times provide more amenities, services, healthcare, and social opportunities to residents. 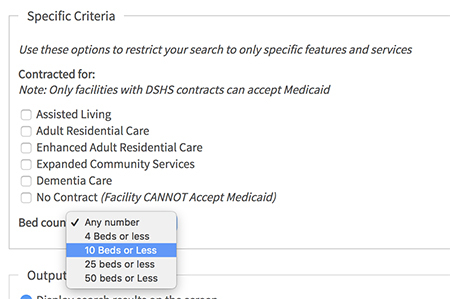 The advanced search, and it’s bed-count feature is very unique and really allows for a customizable search experience through the State’s data on Assisted Living Facilities and Adult Family Homes. 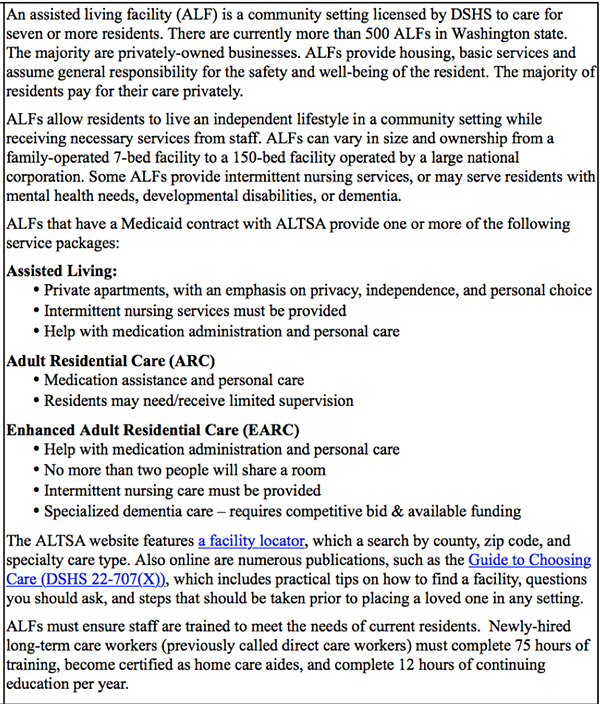 Learn More About Assisted Living Facilities with this informative document provided by the Aging and Long-Term Support Administration. Washington Health Care Association also offers a “Find a Facility” locator and map for the entire state. Long-Term Care Residential Options – A great overview page for Nursing Homes, Adult Family Homes, Assisted Living Facilities, Retirement Communities, Independent Living Facilities and Continuing Care Retirement Communities. This data is provided by the State Department of Social and Health Services.